Lipomas are benign tumors arising from fat cells. Occurrence of lipoma in retropharyngeal space is very rare entity. To the best of our knowledge, this is the second case of pleomorphic lipoma being reported in the retropharyngeal space. They are usually asymptomatic until they are of large size. We report a case of a large pleomorphic lipoma in the retropharyngeal space, with emphasis on the clinical characters and histologic characteristics of the lesion. These tumors are best managed surgically by a transcervical approach. Lipomas are benign tumors arising from fat cells. In head and neck the common sites of occurrence are in the subcutaneous tissues in the shoulder region and back of neck. Retropharyngeal space is an uncommon location for lipomas. Histopathologically, various types of lipomas have been described, of which the pleomorphic variant of lipoma is unusual. Spindle cell/pleomorphic lipoma, accounts for 1.5% of all adipocytic neoplasms. Tumor is composed of primitive CD34-positive spindle cells, floret-like multinucleated giant cells, and mature adipocytes. This variant of lipomas usually present as subcutaneous masses in the head and neck. 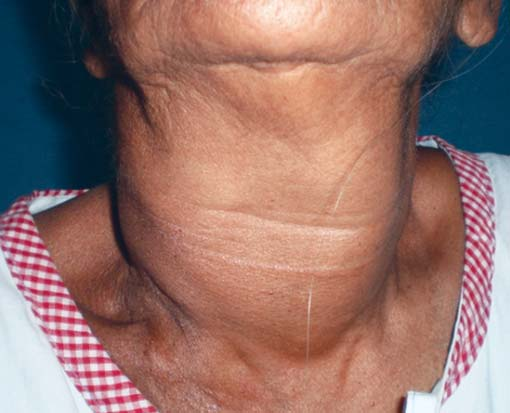 A 75-year-old female patient presented to the Department of ENT and Head and Neck Surgery with a history of persistent neck swelling of 20 years duration. The mass was progressive in nature and was associated with dysphagia, dysphonia and dyspnea on lying down in left lateral position. Clinical examination revealed a soft swelling on right lateral part of the neck about 8 × 6 cm (Fig. 1). Tomography (CT) scan with contrast of the neck showed a well encapsulated, hypodense lesion in the retropharyngeal space extending into right parapharyngeal space pushing larynx and pharynx to left and displacement of right great vessels laterally (Fig. 2). The lesion was seen extending from skull base to upper mediastinum. Fine needle aspiration cytology (FNAC) of the lesion was consistent with features of lipoma. Surgically the mass was removed with a extended thyroidectomy incision extending from right mastoid tip down to left lateral part of the neck. Mass was dissected from the surrounding structures completely with the capsule. The mass was measuring 8 × 6 cm. Histopathological examination showed characteristic &apos;floret&apos; cells which are large hyperchromatic multinucleated pleomorphic cells and lipoblasts with the intervening fibrous septa on hematoxylin and eosin staining, consistent with features of pleomorphic lipoma. Patient is on regular follow-up postoperatively for 1 year and no evidence of recurrence noted. The first case of retropharyngeal lipoma was described by Taylor et al in 1877.6 Lipomas in the Head and Neck region constitute about 10 to 13% of all body lipomas.7 Only about 50 cases have been reported in the literature so far. In the anterior neck presentation of lipomas are usually located in the subcutaneous tissue, tongue, pharynx and larynx, perithyroid region, parapharyngeal region and rarely in the retropharyngeal space. Histological types of lipomas are fibrolipoma, angiolipoma, myolipoma, spindle cell lipoma, infiltrating lipoma.8 Pleomorphic lipoma is a rare histological variant of lipoma constituting about 1.5%.9 They usually present as benign well-defined lesions in head and neck, shoulder and back regions of middle aged and elderly men. These lipomas are considered in the same spectrum as spindle cell lipomas. Pleomorphic lipomas consist of floret-type giant cells within fibrous septa traversing neoplasm. Pleomorphic lipomas contain variable amounts of fat, but in most cases they contain a significant amount of fat. Simple excision is curative with an excellent prognosis. The most important diagnostic difficulty is with that of well-differentiated liposarcoma.1-5 However, these atypical lipomatous tumors occur in the deep soft tissue of the extremities, have a scattered more atypical, hyperchromatic spindle cells in a collagenous stroma with variable amounts of mature-appearing adipocytes and the collagen does not have the characteristic ropey appearance seen in pleomorphic lipoma. They usually present with dysphagia, dysphonia, obstructive sleep apnea and rarely respiratory obstruction, usually over a long period of time. Commonly seen in elderly adults due to their asymptomatic behavior in the early stages.10 Dysphagia is usually more for solids and is usually as a result of prolonged mechanical obstruction. The protracted history usually results in weight loss. Occasional dyspnea is attributable to the compression of the laryngeal aperture by the mass. Dysphonia is usually due to tongue movement restriction and the partial obliteration of the nasopharynx and hypopharynx, resulting in loss of resonance. Direct visual examination wither by laryngeal mirror examination, endoscopy rigid or flexible reveals a bulge in the posterior pharynx which is covered by intact mucosa. The mass if large is palpable in the neck. A lateral neck radiograph reveals a soft tissue mass filling the prevertebral region with occasional calcifications on the surface. The CT scan reveals a homogenous low-attenuation mass of fat density and is pathognomonic. It is very helpful in deciding the approach for surgery. MRI though not essential can help in delineating surrounding great vessels and for differential diagnosis. Needle biopsy has not been shown to be very helpful in reaching a diagnosis in the literature. FNAC in our case however gave a probable diagnosis of a lipoma. The main role of needle biopsy is usually to rule out the possibility of an abscess or hematoma. Surgery can be performed by a variety of approaches.11 Transoral route is safe only for small midline tumors which do not approach the carotid sheath. The submandibular approach can be used for high tumors, while the transcervical approach can be used for low neck tumors. Any pharyngeal tear is identified and repaired immediately and a prophylactic Ryle’s tube inserted. Retropharyngeal lipomas are rare entities. A pleomorphic lipoma occurring in the retropharyngeal region is an even rarer entity and this is the second case being reported to the best of our knowledge. Retropharyngeal lipomas are slow growing, so the patients usually adapt to the symptoms over the years and they usually present a diagnostic challenge. A CT scan is usually pathognomonic. The tumors are best excised by the transcervical route. The pleomorphic lipomas present a diagnostic challenge for the pathologist as they have to be distinguished from malignant soft tissue tumors.